Jon Jones vs. Alexander Gustafsson is just around the corner, and the UFC has taken things a step further with a pleasant surprise for its fans. The UFC's first-ever official meal delivery partner, Trifecta Nutrition, is giving away the opportunity to witness UFC 232 by Octagon-side, for its lucky golden ticket winner. The trip is an enticing one with exclusive VIP experience alongside a whole lot of other goodies! The UFC 232 event, scheduled for December 29th, 2018, is set to take centre stage at the T-Mobile Arena in Las Vegas. The co-main event and main event of the night include four of the biggest names in the history of the UFC and feature both the male and female category. The co-main event consists of a women's featherweight title fight between the champion, Cris Cyborg, and Amanda Nunes. The main event, however, has been booked for a hugely-anticipated rematch between former light heavyweight champion, Jon Jones, and Alexander Gustafsson. Coming after a modified suspension of 15 months, Jon Jones will be returning to the Octagon after temporarily exiting the sport for alleged use of steroids. A trace amount of an anabolic-androgenic steroid, Turinabol, was found in Jones' system by the United States Anti-Doping Agency, just a few days after his title fight against Daniel Cormier, at UFC 214. 'Bones' first competed against Gustafsson, way back in 2013 at UFC 165, in a fight that went down as one of the greatest title fights in the history books of the UFC. Come December 29th, five years after their first meeting, both fighters will be looking to come out all guns blazing for the vacant light heavyweight title. 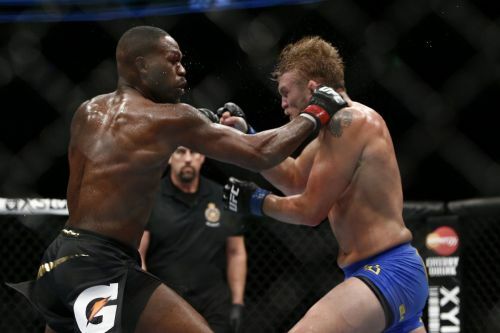 Jon Jones and Alexander Gustafsson in action during their maiden fight at UFC 165! In August of 2018, The UFC announced a new, multi-year marketing partnership with Trifecta Nutrition, the country's largest all-organic meal delivery service. The UFC and Trifecta first collaborated in November 2017, for the middleweight championship fight between Michael Bisping and Georges St-Pierre. 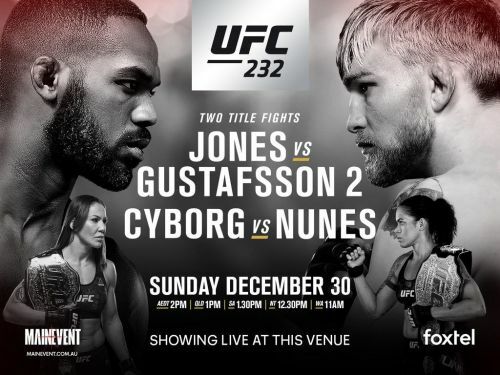 On December 17th, 2018, the UFC announced an opportunity for one lucky winner, to get the chance of witnessing UFC 232, up-close and personal. The winner has been promised two tickets to the fight, stay at a hotel, two air tickets, and a chance to sit close to the Octagon as the action unfolds. The first hundred people to order Trifecta, also get a UFC hat signed by the Team Alpha male athletes; Urijah Faber, Sage Northcutt, Kevin Lee, Alexander Munoz, Darren Elkins and more! Want to sit Octagon-side at one of the biggest cards of the year? Here's your chance to win seats to @JonnyBones vs @AlexTheMauler 2! UFC 232 has raised expectations within the MMA community all around the world with its scintillating fight card. The UFC's partnership with Trifecta is sure to allure fans into many more of such great offers in the future, but the question remains-why wait? Sign up for free with Trifecta Nutrition and win a chance of a lifetime to watch your favourite fighters in action!